A new research report by Persistence Market Research presents complete analysis of the global dental implant abutment systems market along with a comprehensive market forecast for the period 2017-2027. 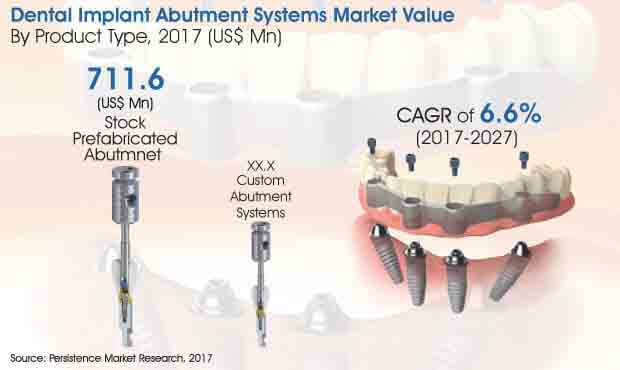 The report has been titled ‘Dental Implant Abutment Systems Market: Global Industry Analysis 2012 – 2016 and Forecast 2017 – 2027,’ and includes information on the overall performance of the market and also the factors that are likely to impact market revenue growth during the 10 year forecast period 2017 – 2027. The report starts with basic information about the market and key highlights of the research outcomes, which includes market share and CAGR during the forecast period. It is followed by the segmentation of the market. The bifurcation plays a major role in simplifying the market study and also helps in better understanding of the global market for dental implant abutment systems. All these segments are individually analyzed, and the report provides relevant statistics based on the analysis, which also consists of a comparative study of the different market segments. The segmentation helps understand the most lucrative segment of the market, investing in which will be beneficial for companies wishing to enter the global market. Furthermore, the report also includes detailed chapters on the competitive analysis of the market, drivers that are boosting revenue growth of market, restraints that are limiting the growth of the market, and also the various trends that are governing the market. Competitive analysis plays a very important role in giving useful insights about the current market structure. The report features detailed profiles of the major players in this market. A dedicated chapter furnishes information on the current developments as well as the future strategies of key market players. It will help the existing businesses and also the new entrants to plan an efficient counter strategy to compete effectively in the global dental implant abutment systems market. The data provided in the report can be beneficial for companies looking for opportunities to either expand in the global market or to understand the whole market from start to end. This research report has gone through a systematic research methodology, so that the outcome is accurate and easily understandable. Firstly, an exhaustive secondary research is conducted to help in collecting all the necessary data such as market size, key players across the value chain etc. Further, various discussions are conducted with different industry experts and analysts. The information about the market, contributed by these experts, adds to the value of the research report. More data is collected from company press releases, company websites, company annual reports, company white papers, and other publications. Once the data is collected it goes through a triangulation method of validation wherein secondary and primary research data along with Persistence Market Research analysis contribute to the final data. The research conducted during the drafting of this report involves dedicated efforts by a large team of analysts who have gone through a vigorous research process in order to come to a conclusion on the global market scenario. Readers are provided with all the useful insights in the most simplified manner possible and this will help save a lot of time and labor. The results are also put through multiple validation layers to ensure that the statistics provided are accurate and present a clear picture of the global dental implant abutment systems market. Dental implants are artificial tooth roots made of materials such as titanium or zirconium that could be inserted into the jaw. They not only allow the replacement of the missing tooth for cosmetic and practical reasons, but also preserve the jaw structure by preventing bone restoration or atrophy. Compared to conventional fixed bridges or dentures, they require no grinding down of healthy neighboring teeth, do not cause discomfort when eating or speaking, and are long-lasting with a natural appearance. Another variation is when the crown and abutment are one piece and the lag-screw traverses both to secure the one-piece structure to the internal thread on the implant. Regardless of the type of abutment, after the abutment is attached to the implant, an impression is made and the designed restoration is constructed at the dental laboratory. The preference for dental implants as a treatment option over conventional devices such as crowns, bridges, or dentures is therefore unsurprising. People are more inclined towards usage of new technologies. People across the world have false teeth or bridges, but dental implants are a relatively new technology. There is also a visible increase in the usage of premium price dental products. This is due to the increase in health consciousness among people. A growing prevalence of local manufacturers and an increasingly cost sensitive consumer demographic is contributing to the overall price depreciation and the declining market share of premium implants. Historically, premium dental implant abutment companies have dominated the global competitive landscape but have recently faced rising competition from value and discount brands. The latest and advanced production technologies have also encouraged manufacturers to increase the production of dental implants. Companies have also expanded their dental offerings to meet the demands of cost-conscious patients as well as physicians. However there are a few factors that may hamper the growth of manufacturers. The stringent regulatory scenario may restrict production growth in some regions with the increase in regulations on medical devices and materials. Some regions like Japan even restrict the entry of foreign manufacturers. There is also a decrease in the reimbursements pertaining to the treatment a patient goes through. Looking at the long-term benefits of dental implant abutment systems, people choose this over any other form of dental treatment. However, insurance companies do not prefer reimbursing that amount and include a lot of clauses or regulations. According to the market research by Persistence Market Research, North America is expected to dominate the global dental implant abutment systems market. Stock/prefabricated abutment systems segment is anticipated to hold the maximum market share in North America’s dental implant abutment systems market. This segment is projected to reach a market value of US$ 254 Mn by the end of 2017, and is estimated to be valued at more than US$ 420 Mn by the end of the forecast period in 2027, growing at a CAGR of 5.2%. However the custom abutment systems product type segment is ahead of the stock/prefabricated abutment systems segment in terms of higher CAGR, witnessing a growth rate of 6.8% during the forecast period.